"My car also turns itself off at a traffic light!" This is a classic when someone is on the passenger seat, while driving. Modern, non-hybrid cars have a start-stop system that shuts the engine down while standing still. A conventional car shuts the engine off after the car has stopped, and re-ignite it before moving again. The HSD system works the opposite way: the engine shuts down before stopping and it starts again after the car is already moving. Here is the detail of a stop at a traffic light. 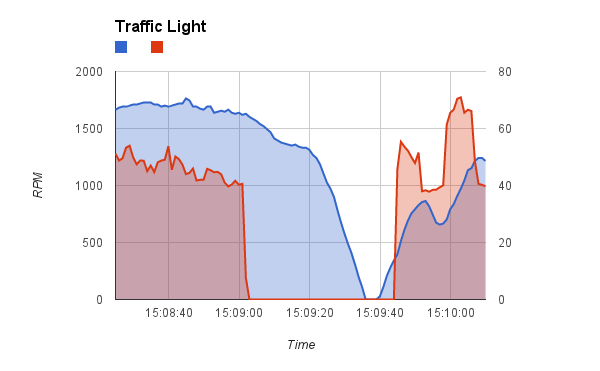 Engine rpms in red; speed in blue. The engine stops 30 seconds before the real stop, and starts again after the car is already in motion.